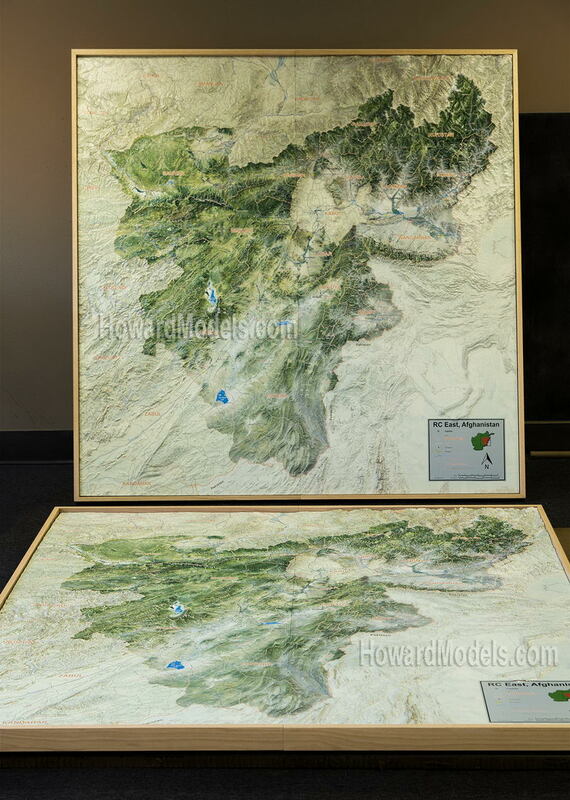 Afghanistan RC-East military terrain model. 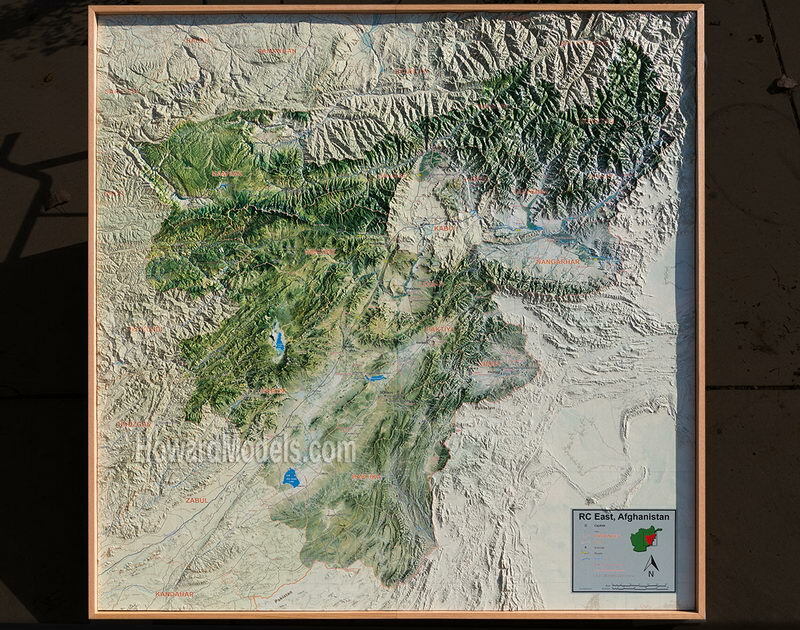 7 military terrain models of RC East Afghanistan. 5' and 3' squares. Close-up of rugged terrain in the North East. 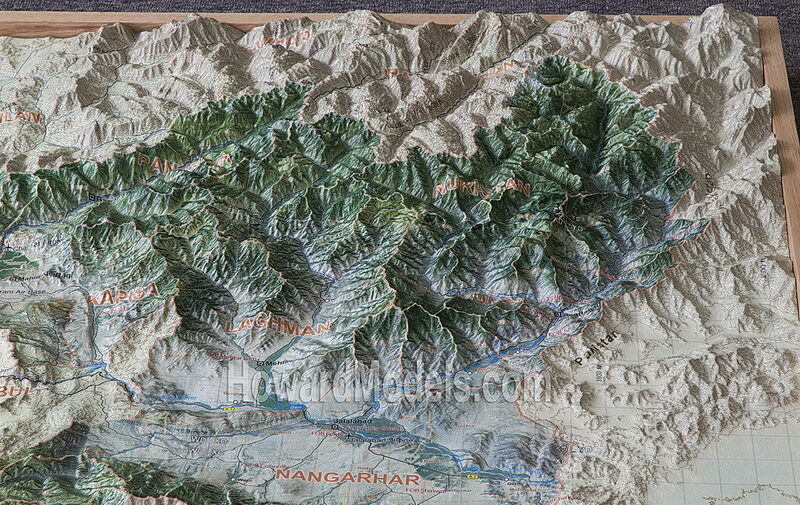 Note the crispness of the rivers, roads MGRS grid and text in the valley. Accurate alignment of printed surface with milled tactical terrain model surface. A pair of 6' square Military Sand Tables. 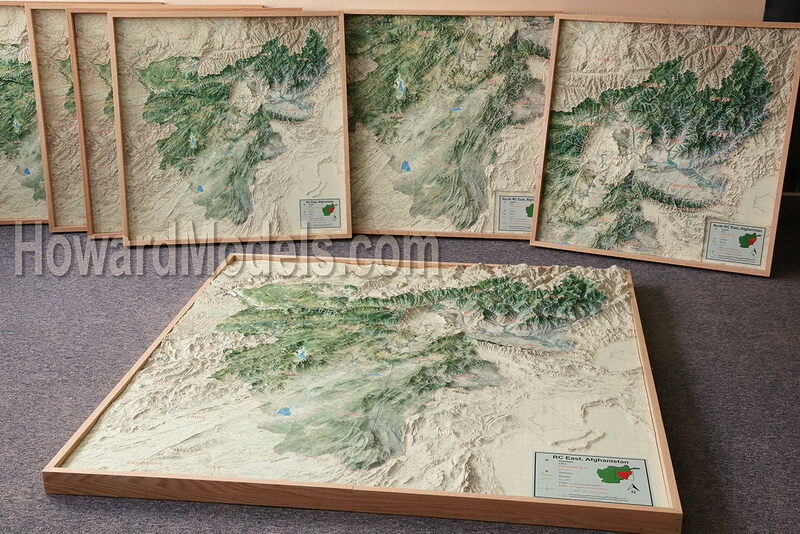 Military sand tables AKA military terrain models or tactical terrain models have very exacting requirements. 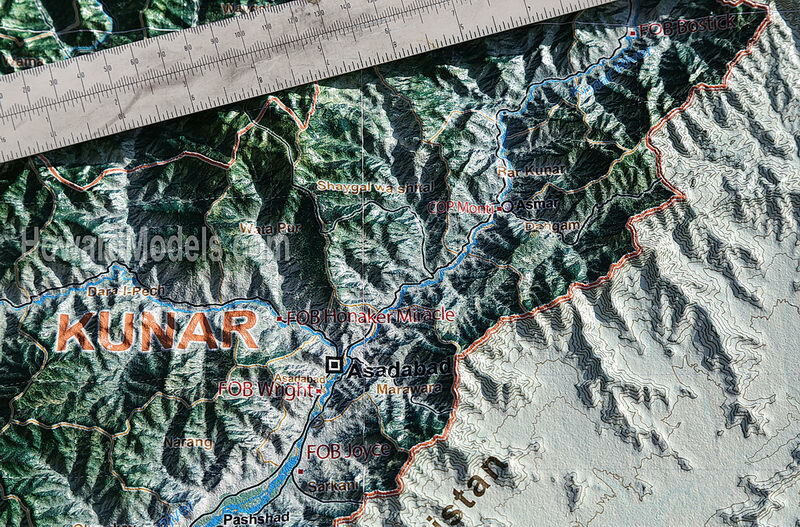 Precision allignment of imagery with the terrain models surface combined with clairity of imagery. 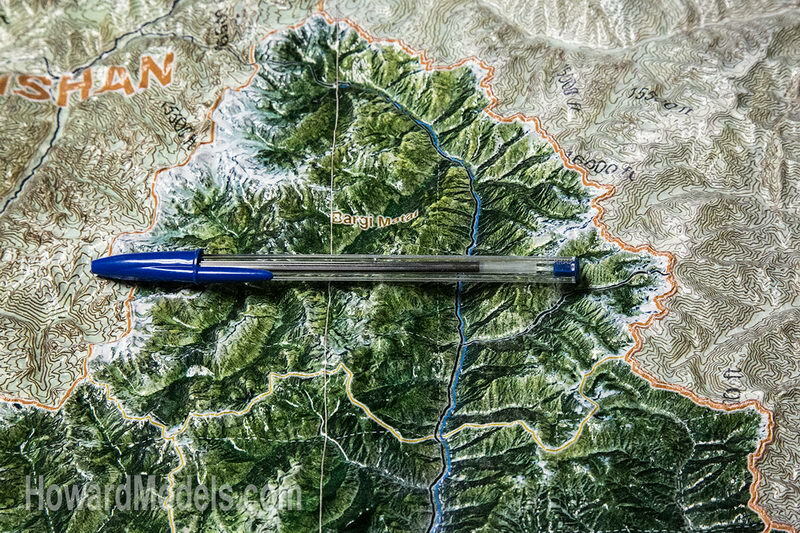 Whether a stream, road or trail through a canyon, resolution is paramount. Blurry valleys were the standard a decade ago but we can now show clearly printed details even at the bottom of a narrow canyon. At Howard Models, we have introduced a whole new level of detail. We have shifted the limits of print resolution on terrain models from process/equipment limitations to what the human eye can resolve. 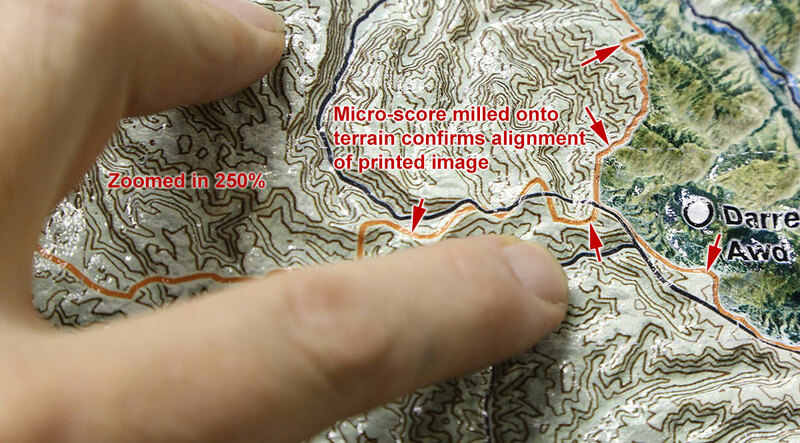 Equally important as image resolution on the military terrain model's surface is accurate registration of the image printed on the surface. When working with high resolution printing, a little thing like a temperature change in the foam from when it was milled can affect the printing alignment with the terrain model's surface. During the cnc milling process, we scribe barely discernible lines on the surface of the model along roads, boundaries and streams. We can then confirm/callibrate alignment of the image. In the above terrain model close-up image with the fingers, the micro-scores can be seen on the orange provincial boundary (top left). Most of our terrain model bases are ready to ship in 2-4 week. These foam and fiberglass terrain models are the ideal base for both study models and finished presentation models.